how many season passes have been sold? I just purchased two season passes for my brother and I and was curious about something. Once the park opens will we be receiving actual plastic cards or are the vouchers I got at the end of the purchasing process the season passes themselves? KEEP YOUR PRINT AT HOME RECEIPT! After the purchasing process online, the printed receipt that is bar coded is what you bring to the office or the locker key house by the entrance to Water World to redeem your season pass. We will take some information from you and take your picture to place on your very own card that you can use the rest of the season to get an All Day Combo Pass whenever you return. 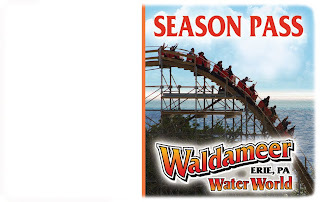 Since Waldameer has opened its online store, online sales have been moving right along. While an exact number is not available, our advice is to get your Season Pass now if you are thinking of purchasing one. The sooner the better and the faster you can enjoy the summer at Waldameer! Will there be any season pass holder 'perks' like most other parks offer, like 'bring a friend free day'or savings on merchandise? Season Pass holders will be able to enjoy perks throughout the summer. All of our Season Pass perks will be announced via email. Make sure to give us your email address when processing your Season Pass card to receive these offers! When can we pick up our season passes? If you have purchased advanced Season Passes, you may turn your ticket or e-ticket in at the Ticket Booths whenever they are open. Ticket Booths open on May 8th and will be available to process Season Passes then.